A giant stream of gas flowing from neighbouring galaxies around the Milky Way is much longer and older than previously thought, report astronomers at the American Astronomical Society Meeting. Using the National Science Foundation’s Robert C. Byrd Green Bank Telescope (GBT) astronomers studied the gas that streams outward from the Magellanic Clouds, providing more insight into the origins of this enigmatic feature. 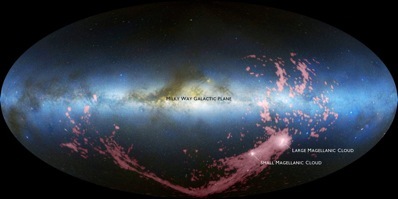 The first evidence for the flow, which is named the Magellanic Stream, was uncovered over 30 years ago, but gaps in the picture left astronomers uncertain as to just how long the stream is and if other patches of gas belonged to the same stream. Combined radio/optical image shows the Milky Way, the Magellanic Clouds and the new radio image of the Magellanic Stream, that is forty percent longer than previously thought. Image: Nidever, et al., NRAO/AUI/NSF and Meilinger, Leiden-Argentine-Bonn Survey, Parkes Observatory, Westerbork Observatory, Arecibo Observatory. Nidever and colleagues used the GBT to study the Magellanic Stream for more than 100 hours, and combined the data with that from earlier studies with other radio telescopes. The result revealed that the stream is more than forty percent longer than previously thought. The extra length means that it must also be older; it is now estimated to be 2.5 billion years old. This fits with the team's earlier work that showed evidence for such blowouts in the Magellanic Clouds. The Magellanic Clouds are the Milky Way's two nearest neighbour galaxies, about 150,000 to 200,000 light-years distant.